The purpose of this letter is to confirm the offer made to you yesterday, which is as follows. We are to pay you eight thousand, five hundred and twenty dollars ($8,520) for your services for the year ending June 30, 1950, payable in twelve equal monthly installments of seven hundred and ten dollars ($710) each, beginning July 31, 1949. It is understood that this consists of the maximum base salary of seventy-two hundred dollars ($7,200) for teaching a day class and an Accounting IIB class two evenings a week. The balance of one thousand, three hundred and twenty dollars ($1,320) is to cover teaching an additional Accounting IIB class two evenings a week. As I explained to you, there is no absolute assurance that we shall be able to give you two additional evenings of teaching thereafter, but we shall do so if we can. If this offer is agreeable to you, please sign the original copy of this letter and return it to me. 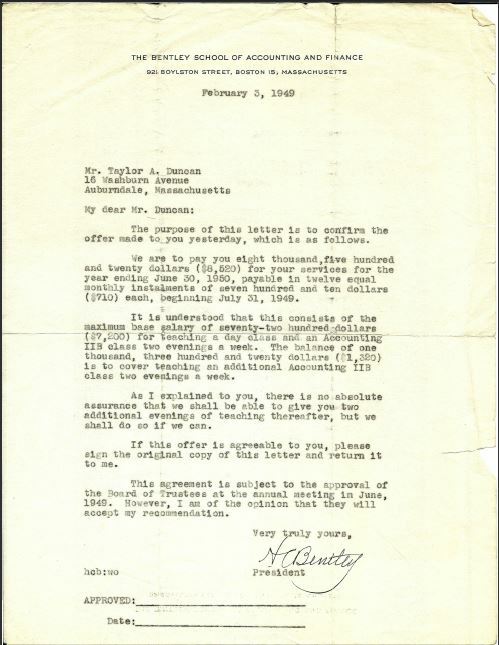 This agreement is subject to the approval of the Board of Trustees at the annual meeting in June, 1949. However, I am of the opinion that they will accept my recommendation. Taylor Duncan named to Bentley, news notice, n.d.
Taylor A. Duncan, B. S. C., C. P. A., has been appointed recently to the faculty of the Bentley School of Accounting and Finance as a full-time instructor. Duncan was engaged in public accounting in Pennsylvania for 18 years and is a certified public accountant of that state. He was a part-time instructor of accounting at Temple University and was at Girard College for six years. 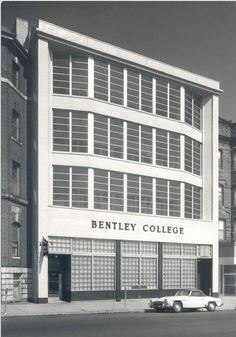 The Bentley School letterhead address is listed as “921 Boylston Street, Boston 15, Massachusetts.” Can someone explain what “Boston 15” referenced? 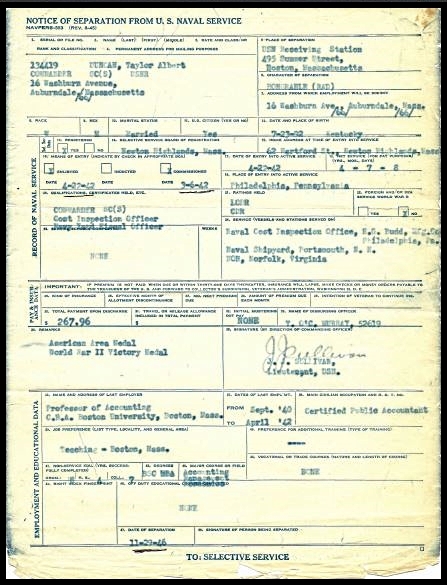 It’s interesting that Grandpa’s title was “Instructor,” v. “Assistant/Associate Professor,” which is today’s parlance for someone without a higher degree who teaches in a college/university, but is salaried v. adjunct. Do you recall his title ever changing as conventions shifted? How common was this title? Was everyone at the Bentley School called “Instructor”? Do you remember if those possible additional evening classes came through? Was he often out at night teaching? Do you recall meeting H. C. Bentley? What was he like? Did Grandpa have a favorite subject/class to teach? What does “IIB” stand for? This entry was posted in Taylor and tagged 1949, Bentley School of Accounting and Finance, job offer on February 11, 2015 by Dawn Duncan Harrell. I want to express our sincere gratitude to you for your generosity in donating Mr. Duncan’s book collection to the Bentley College Library. In as much as these books will be used both by students and faculty over the years, your gift will constitute a truly significant memorial to Mr. Duncan’s long association and interest in the Bentley School (College) of Accounting and Finance. The photographs that you gave us will be put into the College archives. 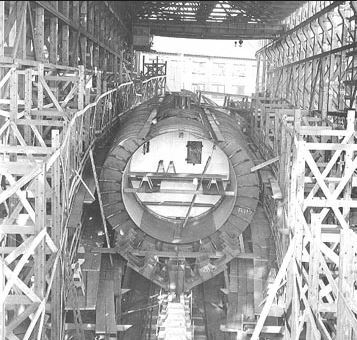 Henry Porter was able to identify all those present in the pictures. 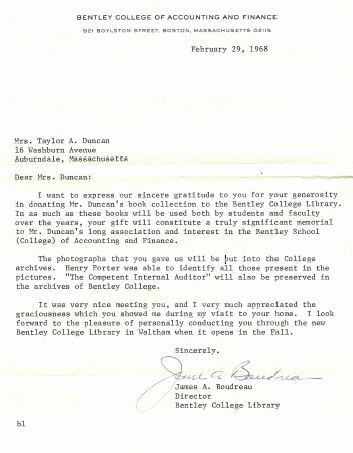 “The Competent Internal Auditor” will also be preserved in the archives of Bentley College. It was very nice meeting you, and I very much appreciate the graciousness which you showed me during my visit to your home. I look forward to the pleasure of personally conducting you through the new Bentley College Library in Waltham when it opens in the Fall. Do you recall the size of the library donation in question? About how many books did Grandpa Taylor have in his collection? What exactly is “The Competent Internal Auditor”? It sounds like a book or perhaps dissertation that Taylor wrote. Can anyone verify that? Does anyone remember Grandma receiving the mentioned tour of the new library? Can you tell what you recall? This entry was posted in Taylor, Virginia and tagged 1968, Bentley College, Bentley School of Accounting and Finance, James A. Boudreau on October 8, 2014 by Dawn Duncan Harrell.